JOIN THE OCEAN FLIPPER CLUB! Our Ocean Flippers have been very successful over the past 21 years. 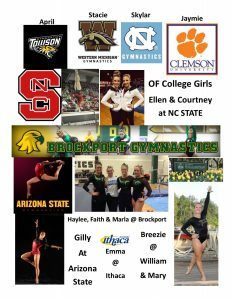 We have numerous state, regional and national competitors that travel all over the country to compete in gymnastics. The expenses that come with traveling and competing can be hard on families and we truly feel that a great deal of our success is due to the support and sponsorship of local businesses. The success we have shared along with the success that we will continue producing is why you should be a part of the Ocean Flipper Club. * Sponsor Page listing in our Meet Programs. **If you are interested in sponsoring an Ocean Flipper, please give us a call 843-249-5867.